The Zinalrothorn is often done as part of a tour from Zermatt that climbs both the Obergabelhorn and Zinalrothorn in a three day period. However the Zinalrothorn itself can be done as a two day trip, with the first day ascending 1700 meters from the village of Zermatt to the Rothorn Hut, then an early wake up to climb the 1000 meters to the summit. What follows is obvious, 2800 meters of descent back to town. Thankfully, there is often a lot of snow once off the climb and for at least a few hundred meters you can put gravity to work in your favor. In 2015, I climbed the Zinalrothorn in one day, from Zermatt, with Ueli Steck as part of his 82 Summits project. While this may not be the style in which many want to do the route, it does show what is possible for those after a huge day of moving quickly - and for those just seeking route info, it's all the same. 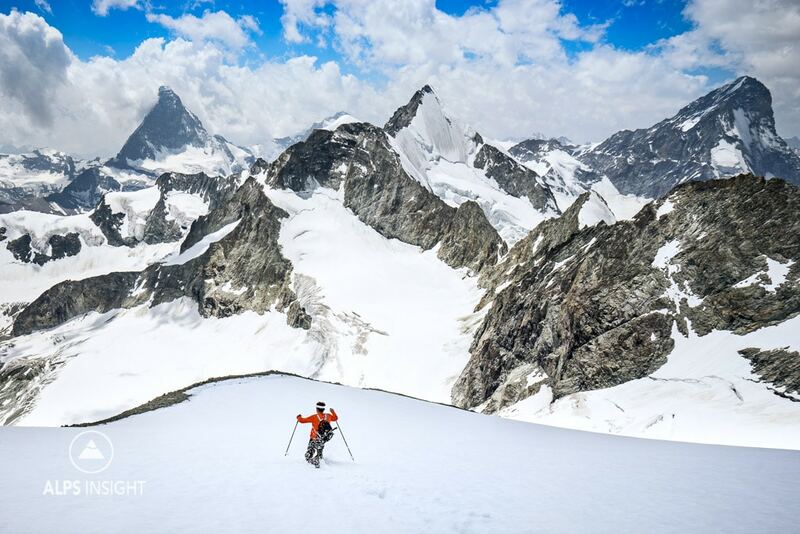 Most parties leave the Rothorn Hut in the pre-dawn hours and climb up easy glacier and ramps to the final snow ridge that accesses a huge open face on the Zinalrothorn itself. The face is split by an obvious weakness and it is through this gulley that the climb goes, through somewhat broken rock and mixed ice and snow until a steep pitch before accessing the actual southeast ridge. Once on the ridge, the rock, gneiss, is absolutely perfect and the climbing up to about grade III(~5.4). 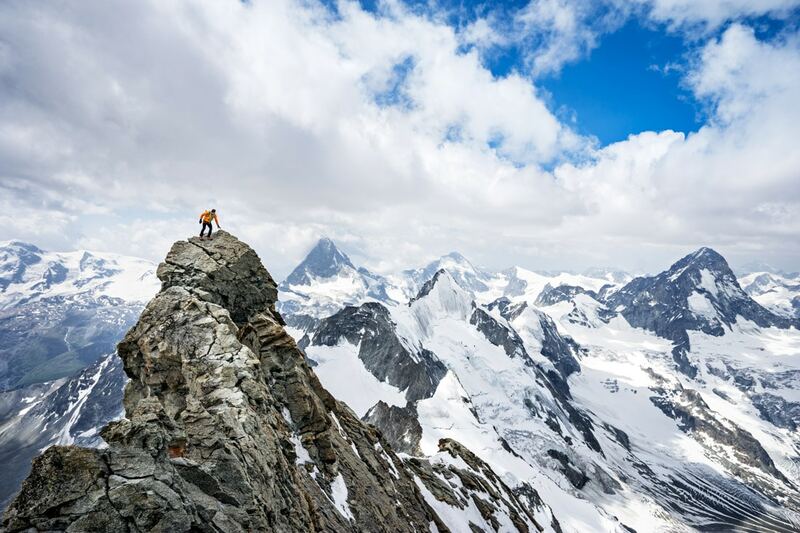 From the summit, the views take in the entire Wallis, including the Matterhorn, Weisshorn and Monte Rosa. To descend, retrace the climbing route. On the descent you will once again pass the hut where you can eat, and pick up anything you left from the night before. The trail down to Zermatt is long, but thankfully easy to walk with two solid options for food; the Trift (great torts!) and the Restaurant Edelweiss. This is both an outstanding tour and classic Alps climb. And again, it can also be done as a three day tour, where first the Obergabelhorn is climbed from the Arbenbiwak via the Arbengrat (AD), descending the Northwest Ridge (AD) to the Wellenkuppe, and then descending the Wellenkuppe (Grade II) to the Rothorn Hut. Day 3 is the Zinalrothorn and descent back to Zermatt. TIP: Ideally this is done with a very good forecast as there are views that you are not going to want to miss. If you aren't very experienced in alpine terrain, this route is a real alpine climb with plenty of decision making required. 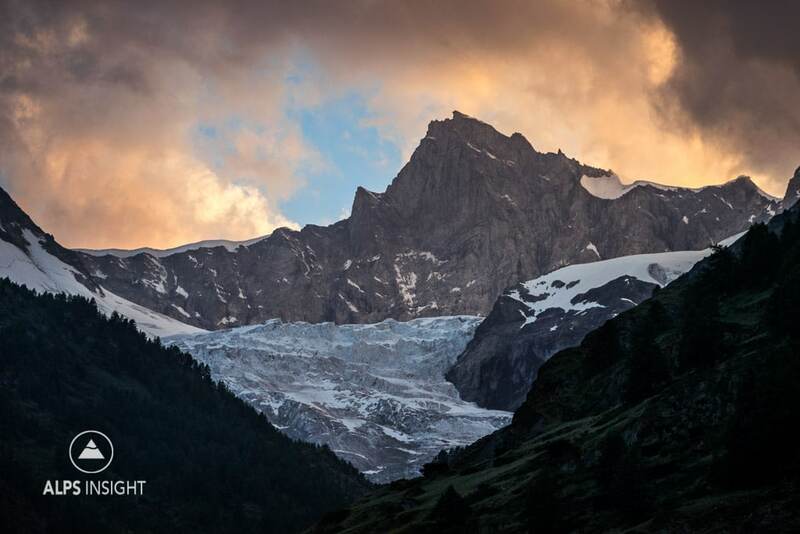 If you aren't experienced, or don't know the Alps, hire a mountain guide. The East Face of the Zinalrothorn as seen from the Mattertal, from Randa. 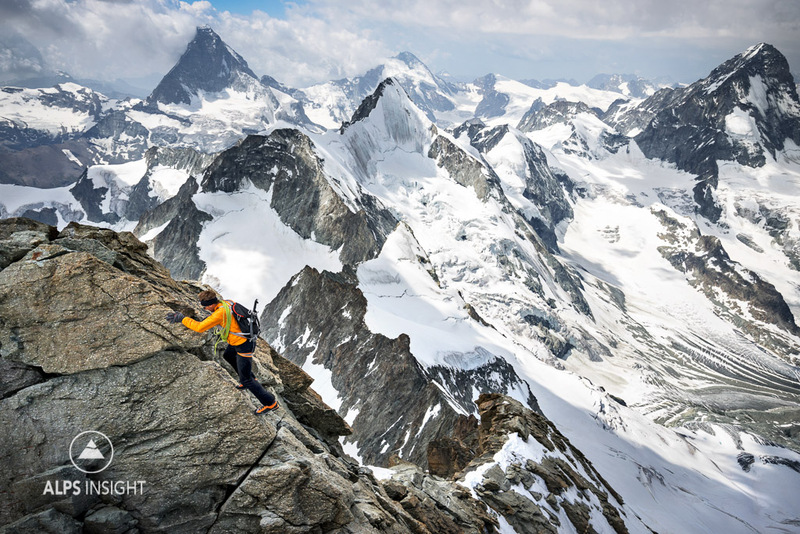 Ueli Steck climbing the last section of rock to the summit, with the Matterhorn behind on the left. 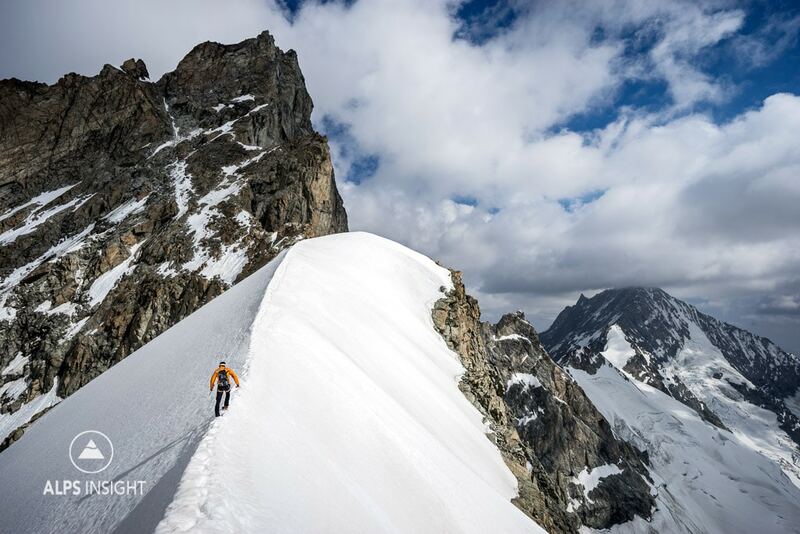 Ueli Steck approaching the base of the Zinalrothorn on the final snow ridge. The normal route climbs the obvious couloir to the ridge. Glissading down snowfields with great views of the Matterhorn, Obergabelhorn and Dent Blanche.